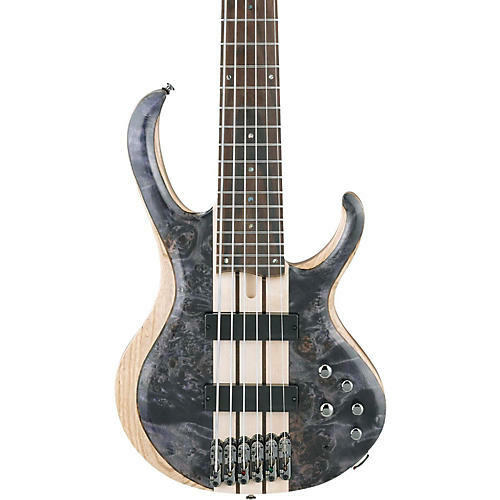 The BTB846 is a 6-string bass featuring an Ash wing body with Poplar Burl top/Mahogany back that creates a sound that is response, articulate, and deep. A 35” scale, 5pc Maple/Rosewood through-neck provides superior resonance, and enhances sustain. The Rosewood fretboard sports highly-durable Stainless Steel frets that produce a clear, bright tone, and a “zero” fret provides accurate intonation, while allowing open strings to ring with the same resonance as notes played up the neck. Electronics include Bartolini® BH2 pickups for a tight bottom-end, punchy mid-range, and smooth response. Combined with the Ibanez Custom Electronics 3-band EQ, w/3-way mid-frequency switch, the BTB846 contains tonal variations that enhance simple chord work, as well as complex soloing. The Mono-rail V bridge allows for a wide range of adjustment, with each isolated saddle securely locked down to the body for optimum vibration transfer, and minimal sympathetic string interference. D'Addario® NYXL strings are installed for expanding dynamic range and harmonic response. A high-tech Neutrik® locking output jack insures a secure connection, preventing accidental disconnect.